Whether your weapon of choice is a Glock 20, Colt Delta Elite, or even the elusive Bren Ten, this 10mm Auto load from Hornady will serve you well. This flat-shooting cartridge uses a 180-grain version of Hornady’s proven XTP jacketed hollow point and achieves a muzzle velocity of 1180 feet per second. 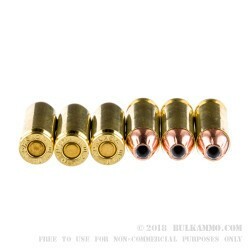 The XTP bullet design’s strong penetration and reliable expansion complement the superb ballistic capabilities of the 10mm Auto, resulting in a potent self-defense round. 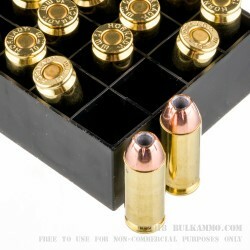 Each box contains 20 cartridges in Boxer-primed reloadable brass casings. Hornady is a Nebraska-based manufacturer of well-regarded bullet components and high-end loaded ammunition. 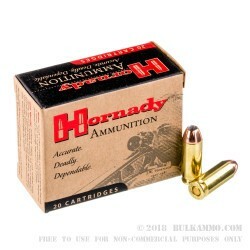 Hunters, CCW holders, and law enforcement officers value Hornady ammo for its superlative quality. The company is led by Steve Hornady, son of founder J.W. Hornady. It employs more than 300 people at its Grand Island facility, which houses all of the company’s raw material, component, and ammo manufacturing operations and covers nearly 150,000 square feet. Q: Are there any discounts for greater quantities than 6? Or is there a way to order in more bulk? A: This is the lowest price we can offer on orders under $25,000. It is possible to order as many as we have in stock by entering your desired amount in the quantity box. Q: Would this be an adequate load to carry in a Glock 20 for hog and/ or other self defense while in woods? A: Yes. 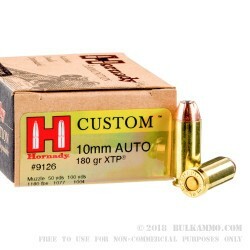 The 180gr XTP driven at 10mm velocities is an excellent choice for the situations you describe.